I have been busily preparing for tonight’s solo performance at the Luggage Store Gallery. Because of all the other things going on in my life and the limited time to prepare, I had to scale back a bit and keep things simple. On the bottom row is a custom analog noise synth with chaotic elements created by Travis Johns, the iPad running Smule Magic Piano, and the monome. Above this row, there is the Dave Smith Instruments Evolver, one of my Chinese metal bells, the iPhone running a looping app that I often use called TTW2, and the MacBook running “mlr2” and other programs with the monome. I am using a few other apps that are not in the photo, including the Smule Ocarina on the iPhone, and SoundThingy and a guzheng simulator on the iPad. This may still sound complex, but each device is small and self contained, and the interconnectivity is kept to a minimum. I can pick each one up and play it while others run independently. I am organizing the set into three major pieces. The first mixes purely electronic sounds with an old NBC broadcast of Count Basie from the 1950s. The second features the guzheng simulator with some rhythmic elements and sample loops, set against the Indian string instruments (ektar and gopichand). The third mixes the Evolver with the Ocarina on the iPhone. One thing that I have revived after not using them for a while is the “Big Band Remotes” recordings from the Internet Music Archive. I still have a recording project I want to finish that uses them, but it also “felt right” to incorporate them into this performance. As she often does, Luna sat down on the beanbag chair to supervise the goings on. At night, she tends to be even more camouflaged than usual. The beanbag chair seems to slowly roll over itself over the course of time in a geological manner. The label from the bottom is starting to show at the top. For those in the area who wish to attend the show tonight, it is at 8PM at the Luggage Store Gallery, 1007 Market Street (near 6th) in San Francisco. 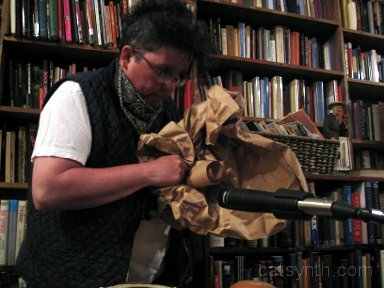 Last Friday, I performed at Book Zoo in Oakland. To start off the evening, I did a solo set, which was followed by a performance of Polly Moller’s The Flip Quartet. Book Zoo itself was an interesting space, with high ceilings and bookshelves. For a space of this size, we had a decent turn-out as well. This was the first time in quite a while that I did not use any software components as part of a solo set. The performance centered around the Line6 DL4 for looping and various delay effects. I made extensive use of the analog-delay simulation for echoes and feedback, with various wood blocks, gongs and the ektar as source material. Of course, the Kaos Pad, DSI Evolver and E-MU Proteus 2000 were also used as electronic sound sources. I also included several beat-based elements, both from hand-drumming and from the sequences are the Evolver and the Proteus 2K, which were matched both rhythmically and arhythmically against the delay lines. Overall, it was not the tightest solo set I have done, but it worked and seemed to be well received by the audience, and stylistically it was a good lead-in to the Flip Quartet. I had seen a recent performance of the Flip Quartet, and this performance followed the same structure and format, but with different performers. In addition to myself, there was Moe! Staiano, Suki O’Kane and Travis Johns. Basically, the Flip Quartet is a composition for four improvisers who move between four stations representing the cardinal directions (north, east, south, west) and the four medieval elements: earth, air, fire, water. Each station had a variety of instruments and sound-making objects to represent elements. Each performer has a three minute timer. The timers are synchronized, and when the three minutes are up, everyone moves to the next station. We rotate around all four stations twice. The “fire” table, which included metal and electronic items, was the most populated, with the water table (liquids, strings) having the fewest items. However, Moe! did bring an interesting old string instrument. It was wooden, had four strings and piano-like keys for striking the strings. It was not an auto-harp, it was definitely something else – and it was the main instrument I played during my trips to the water station. 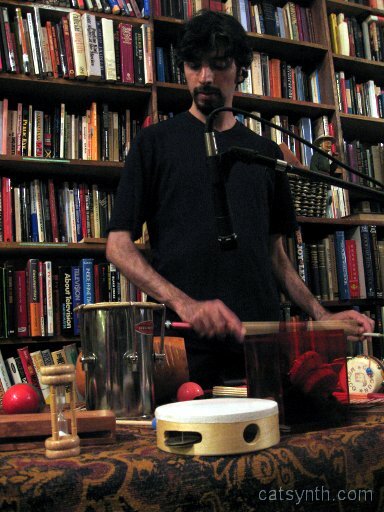 Another interesting addition was the box of worms that Travis Johns contributed to the earth station – the earth station mostly features drums and wooden objects. The worms, were in a box with dirt and vegetable manner, and the box was equipped with a contact microphone that could pick up audible signals from the worms that could then be interpreted musically by the performer. Musically, this was very different from the previous interpretation of the Flip Quartet, a combination of the musicians involved, the objects available, and the setting. There were some cool moments, where two or more performers together make a musical phrase or pattern emerge from within the overall improvisation – that is something I am always looking for. Well, the first big solo show since moving to the city is nearly upon us. And it's a big one, at least in terms of the setup and preparation. Indeed, this is the largest and most complex setup I have used for a live show in quite a while, with both Mac and PC laptops, the tablet, MIDI keyboard, the Evolver synth, and the Proteus 2000 module. And of course the rather byzantine wiring and signal routing to keep it all together. In the photo, one can see not only the equipment, but a couple of the acoustic instruments I will be playing including the ektar and the gopichand. Why such a complex setup? Well, I wanted to a variety of pieces for this performance, combining both the newer simplified performances (such as those I did last year on tour with Polly Moller and Company), with some of the older more complex works. I also wanted to play the tablet, which I haven't done in a while, and it only runs on the older PC laptop; and include a couple of pieces from the CD, including Chimera and a variation on Xi. I was a little bit concerned about pulling out the old laptop for this performance, but after some effort it's running decently, and it's great to be able to blend elements from my older performances with the more recent ones. And in truth some of the older pieces are more fun to play, such as Chimera on the tablet, and the patch that responds to live drumming (officially called “drummer boy”). Luna has of course had to make her presence felt during the rehearsals, as you can see here. After a shaky start, the program has come together quite nicely in the last few days, and I am now looking forward to performing tomorrow. Tonight we feature the much-discussed performance from the 7th Annual Skronkathon two weeks ago. 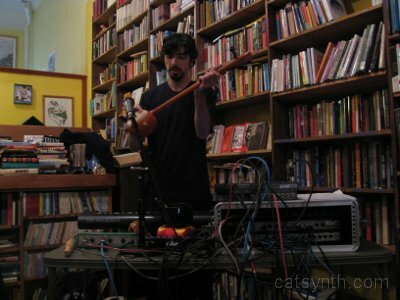 I did a solo electronic set featuring myself playing laptop (running [http://osw.sourceforge.net]Open Sund World[/url]), the Indian ektar and gopichand string instruments, a toy piano, the DSI Evolver, and of course my quacking toy duck (everyone loves the duck). This recording was done my Matt Ingalls for the sfSound Radio broadcast. I edited it a bit, mostly cutting out the empty bits or embarrassing errors. You can see a photograph from the performance here and more info about the technical preparations here. For subscription and listening options, click the “CatSynth Channel” icon in the upper right or the subscription link at the top of this post. And as always, enjoy! Well, there's me, attempting to appear ironic, at the 2007 Skronkathon two weeks ago. I'm playing the ektar, a single-string folk instrument from India, one of several instruments used during the performance. techniques found within improv-based and new music circles. atmospheres and backgrounds for polly's gripping text. who is dajis? 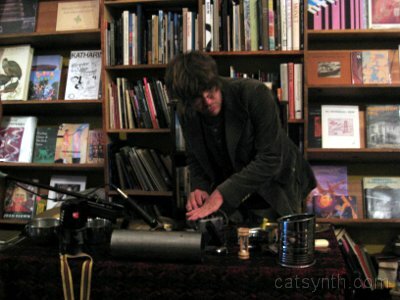 a dj with a selection of ambient and experimental music. Things were looking pretty dire yesterday afternoon, with major audio problems on both the PC and Mac. Without going into details, I was getting intermittent pops, clicks and stutters on the PC, and the Mac was simply outputting something wrong. Eventually, I was able to get the mac working with clean audio, so that became the computer for today's performance, together with an E-MU 0202 | USB and an Xboard. Basically, the mac is running Open Sound World, more specifically, the latest version that works with my new Python interface. Without the pesky graphical interface, the system is rock solid and a lot more efficient to program. It's more akin to SuperCollider or the practice of “live coding”, if you are familiar with either of those. So with this setup, I was able to get things up and running for today very quickly. And it is rock solid, though I don't want to jinx the actual performance too much by describing all the things that didn't happen. The “instrument” for today allows two live recordings to be played back at various rates, controlled by the MIDI keyboard and knobs. I will be playing several of my Indian instruments to feed the recordings, in particular the ektar (single-string instrument) and the gopichand (also single string, with a bendable neck for pitch modulation). One last-minute change was dealing with my Xboard killing itself (something stupid on my part, really). Fortunately, I also have the Novation keyboard as a backup, and although the keyboard itself isn't as good, the controllers are a better fit. Well, actually, this and the folding table I usually bring. Still, it will be very light and relatively easy to set up (especially as the mac boots very quickly).